How do I edit the shipping time for my products? Using the Edit Products tool, you can edit your products' shipping time. First, create a simple .csv product feed file. You must include the Unique Id (or SKU) for each item you wish to update. This goes in the Unique Id column. This column is required. 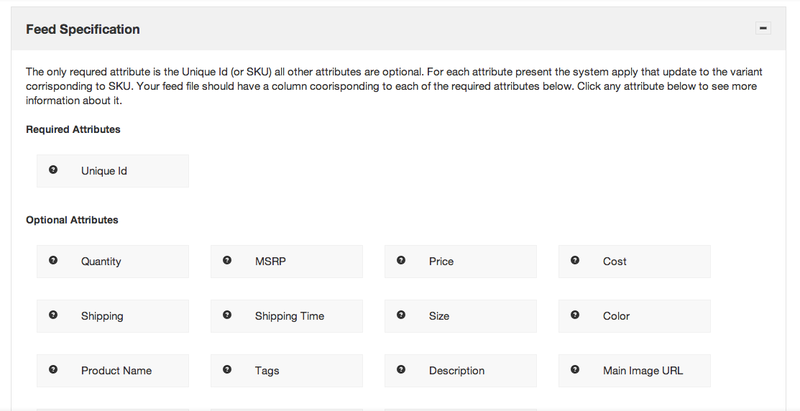 Then, add a column for Shipping Time. Input your shipping time as a range of integers (e.g., 5-10 or 7-21) that represents the number of days from the order date it will take the product to arrive to the buyer. It's that simple. One column for Unique Id and one for Shipping Time. Once the feed is created and saved as a .csv, go to Products > Edit Products > Feed File. This page provides helpful information about uploading. Under Feed Specification, you can click on any attribute for more information. Select your file and click Submit. You can update any attribute exactly this same way. Just switch out the "Shipping Time" column for a column with another one of the Optional Attributes as the title of the second column (make sure to always include the Unique Id column!) and input the relevant information.